Undone: sigh. I don’t want to think about it. Perhaps I should arrange this list by month next year? The QuiltCon cancellation fee is changing TOMORROW. Through Dec. 31, there is a 50% cancellation fee, but after Jan. 1, no refunds will be available. View the full cancellation policy here. 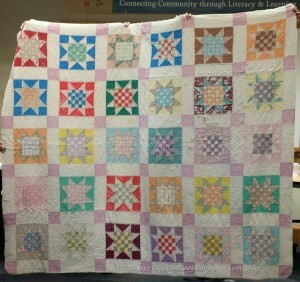 Quilts Inc. Has a call for special exhibits. They welcome submissions for proposed exhibits for future editions of International Quilt Festival. If you have an exhibit proposal or a curated exhibit that you would like us to consider for inclusion at a future show, please email our Special Exhibits Coordinator, Becky Navarro. The page also has a list of already scheduled special exhibits. 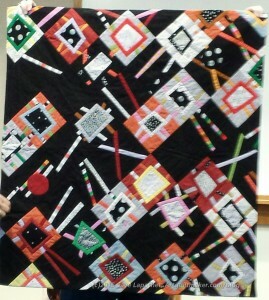 The Best of Show quilt at Houston IQA was by Janet Stone and called Ewe Are My Sunshine. It is cheerful. 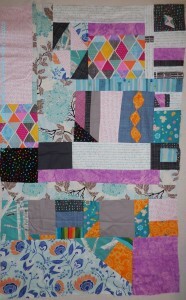 The applique’ quilts seem to do very well. 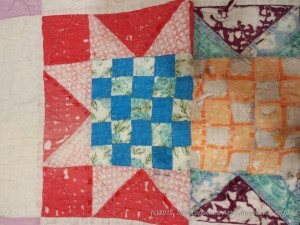 Northern California Quilt Council has a their January 2016 newsletter up. NCQC puts together the New Quilts of Northern California Exhibit at PIQF. There is a GREAT tree quilt included. If you have no other reason to care about Northern California quilts, take a look at the newsletter so you can see that quilt. “A new group is picking up where the National Quilting Association and its remarkable quilt judge certification program left off. After the association disbanded recently, the judges that it certified formed the National Association of Certified Quilt Judges (NACQJ).”The Certified Judge Program has been such a strong voice for fair and professional quilt judging that we did not want to let the program fade away,” says Andi Perejda, the NACQJ spokesperson and a certified judge herself. The group’s goal is to ensure that quilters participating in a competition have the opportunity for recognition and to receive objective, fair and thoughtful written evaluations that will help build their confidence. 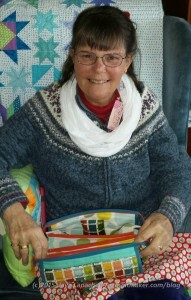 Andi adds that certified judges recognize the emerging movements inn art and modern quilting. At its website, the NACQJ has a list of certified judges along with their contact information and tips for involving judges in organizing a competition and setting categories. Modern Quilt Studio, as I mentioned in a previous issue, has a YouTube Channel. One of their first tutorials was about inset circles. Check out Ruth McDowell’s book on Piecing. You may have to get a used version, but it is totally worth it if you are interested at all in technique. 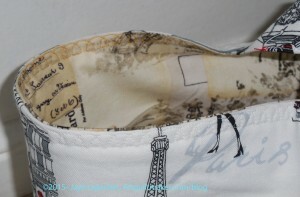 MQS also have a binding tutorial in part 1 and part 2. I haven’t watched either of these videos, so you’ll have to tell me how they are. 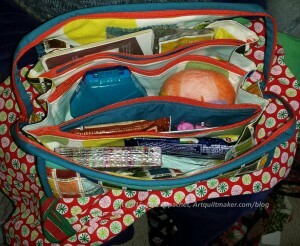 After reading my BBE post, Annemarie asked about patterns for mat/ruler totes, but in the landscape orientation. Fons and Porter had a landscape version on their show using prequilted fabric. It is show #1206 and they have the pattern for sale. The pattern is also in Easy Quilts, Summer 2008. You can watch the show on QNN TV about the bag for $5.99. 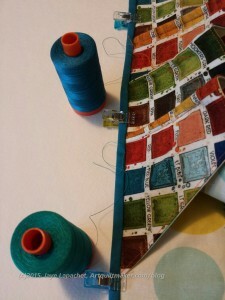 Angie’s Quilts has a photo filled tutorial using measurements from her actual mat and rulers. Moda Bakeshop has a tutorial using a Layer Cake. A bag on the Old Dart Room blog looks like it might be a pattern, but I don’t see a link. I found a mobile ironing board and cutting mat pattern, to which handles could be added to make a carrying case. 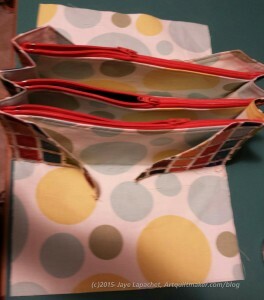 Because I Say Sew has another similar tutorial with the handles already added. I found a Pinterest board and followed a couple of the links to no avail. There have to be some more patterns out there. I’ll keep looking. Let me know if you know of a free or for purchase pattern. Daisy created an Armchair Buddy Tutorial. You can get started on Christmas and birthday gifts for 2016. 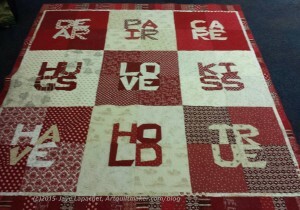 The Janome/ Michael Miller 100 Blocks in 50 Days project wrapped up on Christmas. You can still download all the blocks from that website. Because I am a fiend for blocks, I did save them. I had an idea that I would make all of them, which is laughable now, given the time of the year. I wasn’t wowed by any of them and was a little disappointed to see some classic blocks renamed as part of the project. For example, day 50 had a Dutchman’s Puzzle and it was renamed Pointed Geese. I like the block and think the color choices were good. I would have just liked to have seen some reference to its original name. Perhaps a better challenge would be to take Jinny Beyer’s book, The Quilter’s Album of Patchwork Patterns, and give designs from it to modern designers and have them re-imagine those blocks in modern fabrics. A recent Stashed newsletter had a pattern for a sewing machine cover which includes some embroidery. I was very pleased to hear that Adrianne from Little Bluebell blog and former President of BAMQG has purchased the Pink Chalk properties. You might remember that I wrote about the sale in a recent post. There will certainly be changes, but I am glad this shop will not go out of existence. Kathy did a good job creating the brand and I hope Adrianne nurtures it to further success. Mark Lipinski was in the hospital for over 2 months. He has recently returned home and wrote a post about his journey. If you want to help with medical bills, you can make a donation at the GoFundMe site set up by Meg Cox and Liza Prior Lucy. Over $5000 was raised in the first day, which is amazing to me. It is shocking that we live in a country where people have to raise money to pay their medical bills, but it is what it is at this time. Any amount helps. UGH! Copyright fights again. Bleah. I don’t hate copyright, but I do sincerely dislike it that people spread false information. I found a blog post after clicking on one of Nonnie’s links, that I think has good and useful information AND is cited. I am not a lawyer, but have worked in law firms for long enough to know that you can say whatever you want, but without citations, it is just your opinion. Bonnie Hunter of Quiltville posted a great definition of stress vs. passion. I want it in poster form. Pink Chalk’s Adrianne has some musings about Robert Kaufman’s new color of the year. The color of the year is called either Highlight or Unabashedly Yellow. It is a bright yellow and I think it would fit very well with 1930s feeling quilts especially those using lilac and bubble gum pink solids. Let me know what you think. Need an older or out of print fabric? Try Obie’s, if you can stand it. The review makes it sound fantastic and frightening. 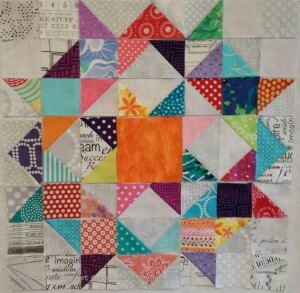 The Patchwork Almanac, a GenQ Quilt-a-Long is coming in 2016. 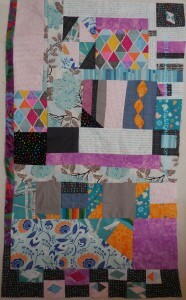 This quilt -a-long was designed by GenQ’s own Scott Hansen, also of Blue Nickle Studios fame, to use up your scraps. There is a picture, but for directions and more info, you will have to wait for the next issue. If you like mysteries or character driven novels, read Meg Gardinier’s blog post, where I am mentioned. Then buy The Dirty Secrets Club or another one of her books for “light” New Year’s Day reading. My dad is getting ready to retire soon. He plans on driving around the country pulling a trailer to visit his friends and fish. He loves to fish. He doesn’t want to acquire stuff, so pillowcases are something he can use on his travels and will be theme appropriate. I have been, since he told me of his plans, trying to get him gifts that are either use-up-able, useful for a trip or he can use to pack. I had forgotten about my well laid plans. When I washed some fabric last weekend, I found the fish fabric I had bought a few months ago to make my dad pillowcases for Christmas. Deadlines were getting short and I knew I would have to be quick, so, after finishing the Sew Together Bag, I got down to pillowcase business. By now I have made so many pillowcases that they went together quickly. the biggest problem is picking out cuff fabric and I was able to find and use the last bit of yellow Reflections fabric for the cuffs. 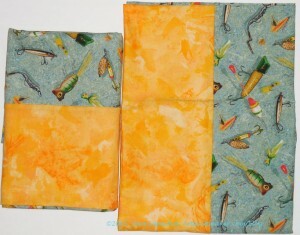 I think it adds a bit of cheerfulness to otherwise drab fabric. I made this Sew Together Bag for my mom. I like the way it turned out, but had some issues making it. This is a challenging pattern. 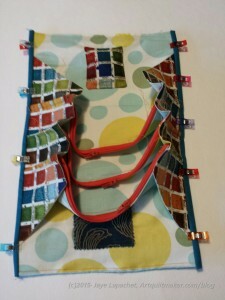 The combination of the zippers and the layers which need to be sewn together combine to make this project a challenge. The first problem I had was with the directions. Because cutting is a good activity when I am away from my workroom, I decided to cut out the bag when I went to Reno to visit Kathleen. First, I read through the directions. The first page talks about “embellishments.” When I think of embellishments, I think of beads, buttons, charms, stitching. I think these things are included in what the directions are getting at, but I think the designer really meant special piecing and quilting. I wanted to quilt this piece a little to give the outside some heft, but the directions were very unclear on whether I was supposed to quilt the exterior and the batting or add a backing/lining piece and quilt through the three layers as I would a quilt. I ended up making a two layer sandwich (no backing) and quilting that. 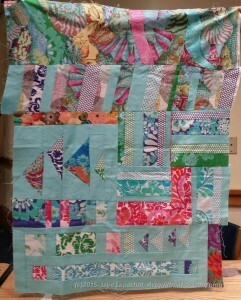 The piece ended up too small and I am not sure whether I quilted too much or whether I cut the piece too small. I’ll have to check and see if I cut it wrong when I made the next one. I thought I would be defeated by this pattern when I got to the pocket panel. I had no idea what the designer was trying to say when she said to put the four pocket pieces together. The section isn’t difficult to actually do, but explaining how to do it is difficult and I could not understand the pattern. 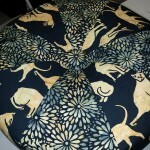 I looked at the Sew-a-Long blog post describing this step and that helped a lot. This is the hardest step IMO. After doing the pocket panel, the thickness began to kick in and wreak havoc with my attempts to make the piece look professional. I think someone with a Juki or other pseudo-industrial machine may have an easier time. I was stymied for a bit because I didn’t have the correct colored thread. I wanted the thread for the binding to match the binding. 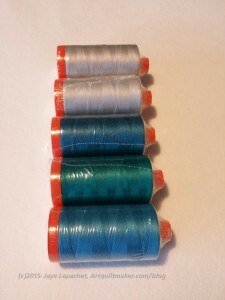 I ordered from Red Rock Threads and had the thread in a few days. Hooray for great customer service and fast shipping. Once I had the thread, I was able to finish the bag. It was slow going, but I did it. WonderClips are not mentioned on the supply list, but I found them to be invaluable when holding the piece together to sew on the binding. 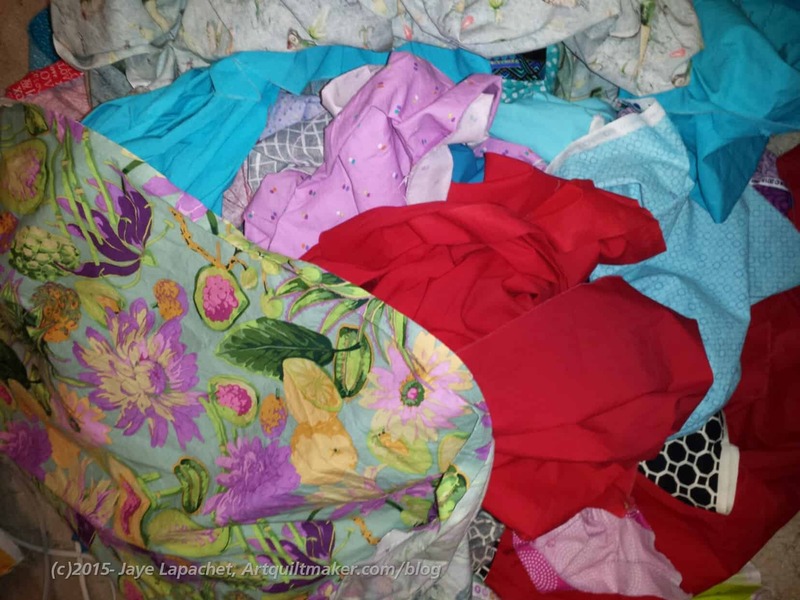 I really could not have gotten through this pattern without the archived sew-a-long directions and all of the photos showed in the Quilt Barn blog. 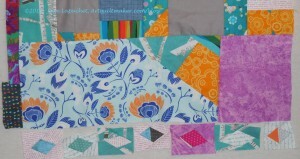 Click on the link, print the blog posts and keep them with your pattern. Mom really liked the bag, for which I was very grateful. She opened it on Christmas and filled it up with her small gifts and stocking stuffers to transport home. I did struggle with the construction, but felt confident enough to make a second bag, which I have started and am a step plus some thread weaving in from finishing. I just bought zippers to make two more. I have a lot of fabric to press and cut, especially since I washed several yards the other day. I am determined to get busy on FOTY 2015 early in the year. It won’t be until at least February as I won’t be able to sew on most weekends in January. That means no sewing. I wonder what I will write about? I want to do FOTY 2015 early in the year so there is less overlap with FOTY 2016. I am not sure how that will go as this is all the progress I have made since the November 16 post. I should go and count my patches to see how many I had. I really don’t want a repeat of cutting down all the patches like I did for FOTY 2014. My sister left a comment on the post back in August after I made and wrote about the blue batik One Hour Basket. She wanted one. She offered to send fabric, but there is no fabric shortage here. Her comment gave me an idea for a Christmas gift. During my travels back from taking the Y.M. 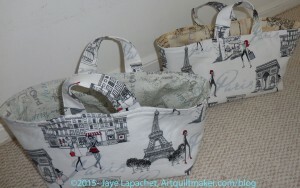 to college I bought a couple of yards of Paris fabric with this project in mind. I sat down and made the baskets over Labor Day weekend while I recovered from food poisoning and DH was at the Native Sons. I really hadn’t been doing much sewing, so it killed me not to be able to post these right away, but I know my sister visits my blog, so I had to resist. I used a slightly larger seam allowance for the interiors just to see if the interiors wouldn’t be so baggy. This worked and the interiors were slightly less baggy than my previous attempts, which was nice. I also used different colored threads in the top and the bobbin to match the fabrics when I top stitched the top of the basket. I was pretty proud of myself for that! These turned out well. I sent them off and with any luck, Lil Sissy had them in her hot little hands for Christmas. I refuse to make promises about next year or commit to making 12 of anything right at the moment. If I were in that kind of mood, I would consider this project for those types of gifts. I have some strips leftover from this project and was wondering what to do with them. It turns out Lil Sissy also wants a Sew Together Bag. I suppose that would be a good use of the strips. Nota Bene: For those of you who don’t celebrate, I apologize. This was too good of an opportunity to pass up. Please select your own word and post a link to your response. I appreciate your understanding. Definition: “Christmas or Christmas Day (Old English: Cr?stesmæsse, meaning “Christ‘s Mass“) is an annual festival commemorating the birth of Jesus Christ, observed most commonly on December 25 as a religious and cultural celebration among billions of people around the world. A feast central to the Christian liturgical year, it is prepared for by the season of Advent or the Nativity Fast and initiates the season of Christmastide, which historically in the West lasts twelve days and culminates on Twelfth Night; in some traditions, Christmastide includes an Octave. Christmas Day is a public holiday in many of the world’s nations, is celebrated culturally by a large number of non-Christian people, and is an integral part of the holiday season. The celebratory customs associated in various countries with Christmas have a mix of pre-Christian, Christian, and secular themes and origins. Popular modern customs of the holiday include gift giving, completing an Advent calendar or Advent wreath, Christmas music and caroling, lighting a Christingle, an exchange of Christmas cards, church services, a special meal, and the display of various Christmas decorations, including Christmas trees, Christmas lights, nativity scenes, garlands, wreaths, mistletoe, and holly. In addition, several closely related and often interchangeable figures, known as Santa Claus, Father Christmas, Saint Nicholas, and Christkind, are associated with bringing gifts to children during the Christmas season and have their own body of traditions and lore. Because gift-giving and many other aspects of the Christmas festival involve heightened economic activity, the holiday has become a significant event and a key sales period for retailers and businesses. The economic impact of Christmas is a factor that has grown steadily over the past few centuries in many regions of the world. Wacky probably isn’t a good way to describe the sewing I did over the weekend, but the alliteration is good. I was working on finishing things and didn’t work on one particular project. I worked on many. I finished two Christmas gift projects (look for posts next week) and was doing some making that was for fishing up projects. It sounds boring, but it was really good for me. I felt like I was clearing the decks and really getting projects off my list and making space in my head for new projects. Or other projects to finish. One load I washed was lights so I could cut some squares for a couple of projects. 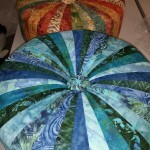 As a result, I was able to add to my collection of squares and rectangles for FOTY 2015, the Stepping Stones project and add some fabrics to the most recent Carpenter’s Wheel block. The Carpenter’s Wheel block has been sitting on the design wall half assembled for awhile. I now have enough pieces to start sewing it together, but I am not 100% sure I like that orange center. I am afraid it looks like a big hole. I made the binding for the Black and Red Improv quilt. I will send that off to Colleen so she can apply it to the quilt when she returns from her holiday travels. That was a huge load off my mind. I also made several pairs of Flying Geese units for the swap with TFQ. I needed to beef up my supply, though I am afraid I have too many pieces and parts and the swap will end before I run through them. All in all, I think Sunday was exceptionally productive. I felt good to be sewing. I had two recent opportunities, the IRR post and the BAMQG Meeting post, to talk about my round robin piece, which is still circulating, and missed both of them. I was able to glimpse the work done on my piece at the meeting last week. I think my piece is looking spectacular. There is a lot of interest because of the improvisational piecing. There is also cohesion because of the limited palette of fabrics. I am so thrilled that some of that Philip Jacobs (or perhaps Martha Negley??) fabric was added (shells at the top). I love the boldness of it. I would like to take a better look at it as I see some other fabrics tucked into that top section. As I said before, the pieces are getting quite large and mine is no exception. I think it is probably NICU size right now, or slightly larger. I want it to be larger, but may have to add bits of my own at the end. People from other groups are still working on it, which is great. We had a Winter Extravaganza-palooza last Saturday. We had a regular meeting (see the notes on the BAMQG blog) and then we had food laden party. Part of the party was that the swappers exchanged gifts. I talked about that in the BBE post. A lot of people made bags as gifts. There was an exceptional amount of good work. There were a lot of good show and tell as well. I didn’t have anything finished, so I only showed the BBE. Claire showed an amazing vintage quilt. It gave me an opportunity to voice a design thought I have been mulling over. This pattern in this vintage quilt looks like a Sawtooth Star to me. I have been thinking that taking some of the Postage Stamp donation blocks and adding Flying Geese to each side would make an interesting star. I mentioned it to the Charity Girls, Peggy and Michelle, and they loved the idea. I am going to see how it would work using my Wing Clipper. 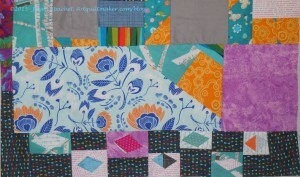 I really liked some of the color combinations of this quilt. They were really bold and exciting. I have to remember to think about it when I am choosing fabrics. I just don’t think about it. The blue and the dark salmon (pinky red??) are a really excellent combination! I want to make something with that color combo! The quilt is in horrendous condition and I am not sure it can be saved. The design inspiration CAN be saved, though. Amanda finally finished her Love Quilt. 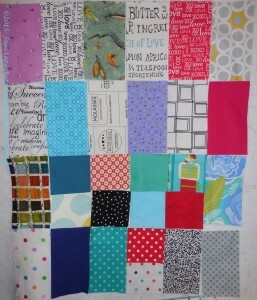 At least, I called it a love quilt. She made it for friends who had a wedding anniversary. It is her own design and I have seen her working on it for a few years. I am sure others would love to make this and think she should create a pattern. CC made a really interesting quilt that looked like fireworks or something exploding to me. In a good way, of course. There was too much going on to really relay it all. You should come to a meeting. The first one is free. I saw these leaves when I was walking down the street in the rain (Yay, rain!!). 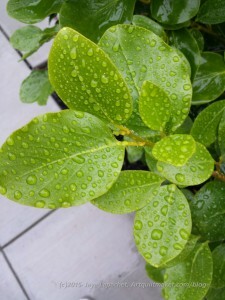 I love the droplets on that beautiful shade of green. At the meeting the other day, everyone doing the IRR challenge got together and we swapped pieces. We changed things up and I now have Angela’s IRR piece. We were not originally in the same group. Her group was small and everyone had worked on all of the pieces at least once. I didn’t have one to work on so I volunteered to work on Angela’s. The pieces are getting quite large. I quickly put a signature strip on the side and then started thinking about what I could add that would look great. I liked the castle fabric, but wasn’t sure about just putting in a big strip of towers. The diamond motifs caught my attention and I started working on adding free form diamonds. I have a hard time being completely free form/improv-y, but I did my best. I tried to make the diamonds not in alignment. I didn’t like the way they looked. I sewed the diamonds to backgrounds and played around with them a bit. I looked at the piece and saw that dark grey kite fabric. I played around with that fabric and came up with a kind of checkerboard effect. I like the way it turned out. I think the dark fabric adds a bit of a frame to the piece and sets off the diamonds as well. I also like the visuality of the dark fabric going around the corner. a cabin on a suspended ski lift. an open railroad freight car. Gondola Servizio: Authentic Venetian gondola tours on Lake Merritt in Oakland, California at the Lake Chalet Seafood Bar and Grill. The Gondola Company in Coronado offers romantic Venetian gondola rides on San Diego bay, California. Gondola Paradiso, the only place in Ventura County where you can take a Venetian gondola cruise. Gondolas West’s nature over noise, glide along the waterways of the scenic New River and the beautiful canals of Fort Lauderdale in our silent electric boat. 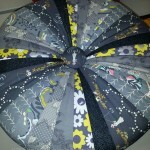 I went to class on Monday with Robin and finished my Tuffet. As I said the other day, I worked on making the cover at home by myself. I couldn’t do the other parts so off to the finishing class I went. I had forgotten to do the drawstring, so I took my machine and did that part in class. It was fine and I helped another student who was on that step in class as well. 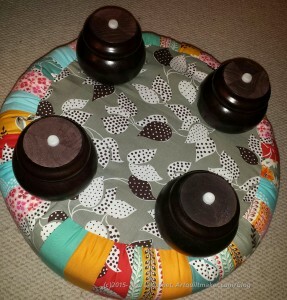 Robin had carpet tacks, or, probably, furniture tacks, this time and many of the people in the class used them to put down the bottom cover of the Tuffet. I did mine the same way I did the last one, which was to hand sew down the grey over the drawn up cover. We also had a problem with my feet. I wanted the same feet as Tuffet #1. I put 3 feet on and found that the fourth was not the same style. Someone out there has a Tuffet with my last foot. I switched out the feet for a different kind. The new feet are the same color as those on Tuffet #1. No big deal. The class was pretty full with 4 other people there, two of whom were making 2 Tuffets each! Two of the women making 2 Tuffets and one other woman were all making Tuffets for their children. I am not making one for the YM until he gets his own apartment and then we will see. He will have to ask VERY nicely. As usual, as soon as I saw the other Tuffets, I wanted those instead of my own. Everyone else said how bright and cheerful mine was. 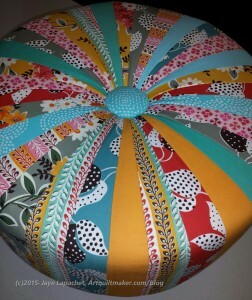 I love the Kaffe Tuffet. LOVE it! Click on the photo and make it bigger so you can see how fantastic it is. I love the colors – they are bright and cheerful. I also love the juxtaposition of the fabric pattern motifs. One thing that was different in this class is one student used one fabric per foundation (Katrina’s Tuffet, bottom right), which is a great way to showcase the fabric and makes the Tuffet-making go a lot faster. Robin is still awesome and if you have a chance to take her class, you MUST! I had a great time chatting with her. 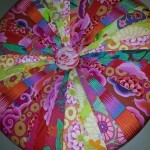 I want to help her spread the Tuffet love throughout the world.